Among the latest eBay Deals which have a Black Friday flavor of course you can get the manufacturer refurbished GO PRO HERO5 Black action camera for $150 with free shipping and a 1-year warranty from GoPRO. Up to five per customer at the sale price. This is sold by the official GoPRO eBay store. Nearly 1000 units have been sold so far. Free shipping for Prime members or $5 flat shipping for everything you buy from Woot during a single calendar day (in the central time zone; that’s when the daily deals change at Woot). These however are Woot Plus offers, so they last for a few days (unless they sell out quickly). One of the Woot daily deals for Wednesday is the refurbished GoPro HERO3+ Silver Edition Camera offered for $85 with a 90-day Woot warranty. Limit up to ten per customer. Free shipping for Prime members or a $5 flat shipping for the calendar day for non-Prime members. A $10 price drop since early April 2018 takes us back to the of the eBay Deals where the official GoPRO eBay store is offering the manufacturer refurbished GoPRO HERO4 Black action camera for $130 with free shipping and a 1-year manufacturer warranty. Limit up to five units per buyer at the sale price. 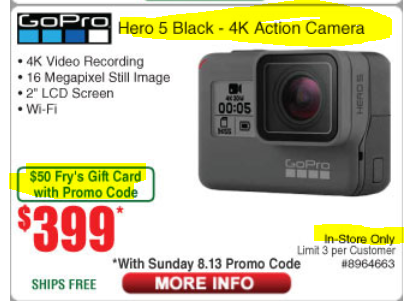 Meanwhile B&H Photo is offering an alternative to the previously mentioned Target offer on the new condition GoPRO HERO 5 Black. The B&H Photo offer comes with a $25 B&H e-gift card, a 32GB Sandisk Ultra microSDHC card, and a GoPRO rechargeable battery for the same price of $250 with free expedited shipping. Back to the land of the eBay Deals where the official GoPRO eBay store is offering the manufacturer refurbished GoPRO HERO4 Black action camera for $140 with free shipping and a 1-year manufacturer warranty. Limit up to five units per buyer at the sale price. Front and center at the eBay Deals the official GOPRO eBay store is offering the manufacturer refurbished GoPRO HERO5 Session for $120 with free shipping and a 1-year warranty. Up to five per eBay user at the sale price. While we are on eBay, the official Monoprice eBay store is offering their own new condition Monoprice 27″ WQHD 2560x1440p TN-LED 144Hz Ultra Slim Aluminum Monitor FreeSync for $250 with free shipping with up to five per eBay user at the sale price. You get a GoPro! You get a GoPro! Repeat four more times! B&H Photo is offering the GoPro Omni (All Inclusive) spherical rig which includes six GoPRO HERO4 Black Cameras, along with the Omni rig and a variety of accessories necessary to configure it as a six-camera critter. Speaking of action cameras, there are a couple of active sales on YI action cameras at the moment..
Back to the eBay Deals we go where the official GoPRO eBay store is offering the manufacturer refurbished GoPRO Hero5 Session for $160 with free shipping and a 1-year warranty from GoPRO. Limit up to five per customer at the sale price. The new condition price is $200. If you missed the previous sale, fear not, it is back! It is the new condition GOPRO HERO6 BLACK going for $400 with free shipping at Amazon by Amazon itself with up to three per customer at the sale price. This is not a lightning deal. The new condition GoPro HERO6 Black action camera is currently on sale for $400 with free shipping at Amazon by Amazon actual with up to three sets per customer at the sale price. This is an old fashioned sale, not a lightning deal, so expiration time is unknown. The prices of the various other kits are adjusted accordingly to the sale price of the root model. Back to the eBay Deals we go, this time it is the official GoPRO eBay store that is offering the manufacturer refurbished GoPro Karma Lite + Black Harness + Karma Grip + Karma Controller + Karma Case for $429 with free shipping and a 1-year warranty. Limit three per customer. GoPRO Hero Camera is NOT included. The Woot Deal of the Day running until Sunday at 1am ET (or earlier if sold out) is the refurbished GoPRO Hero 4 Session for $100 with a 90-day Woot warranty. Limit up to three per customer. Shipping is the usual $5 flat for the whole calendar day in the Central time zone. The Electronics daily deal is various Motorola unlocked phones, while the Computers daily deal is a Dell 2-in-1. More GoPRO discounting, the new condition GoPro Hero5 Black is now down to $299 with free shipping at B&H Photo and at Amazon (3rd parties) which also offer an e-commerce packaging option (fulfilled by Amazon). Meanwhile the latest model, the Hero6 Black has a more modest discount to $450 at Adorama and Amazon and B&H Photo. A new shopping week (it is Sunday in the eastern time zone) brings up new discounts on the world of GoPRO. The GoPro Hero5 Session Holiday Bundle drops from $249 to $199 with free expedited shipping at B&H Photo. The “Holiday Bundle” is the GoPRO Headstrap/QuickClip and 16GB Sandisk microSD card over the standard kit. But Adorama created their own bundle with the Headstrap and a 64GB Sandisk Extreme microSDXC card instead, for the same price of $199 with free shipping. The GoPro Hero5 Session Holiday Bundle is on sale again, going for $249 with free shipping at Amazon by Amazon itself (limit two) and B&H Photo and Adorama. What makes it a “Holiday Bundle” is that it includes a Headstrap/QuickClip and 16GB Sandisk microSD card over the standard kit. Some of the GoPRO Black Friday offers have ended but continuing is the GoPro HERO5 Session Holiday Bundle for $249. This includes the GoPro Head Strap + QuickClip and a 16GB Sandisk Extreme microSD, offered at this price at Amazon by Amazon itself (limit two) and also at B&H Photo and Adorama. Back to the eBAY Deals we go, where the official GoPRO eBAY Store is offering the manufacturer refurbished GoPro Karma with Karma Grip+Karma Controller+Karma Case+HERO5/6 Black Harness bundle for $399 with free shipping with up to three sets per customer at the sale price. One year warranty is included. Note that a GoPro HERO 5/6 action camera is NOT included. You get the Karma drone with a grip, a controller, a case and a harness for the HERO cameras, but not the actual HERO cameras! Apparently I haven’t posted this yet, it is the new condition GoPRO HERO 5 Black bundled with a $50 house gift card for $350 with free shipping at Amazon by Amazon itself (limit one) and at Adorama and at B&H Photo… By “house card” I mean at Amazon you get a $50 Amazon Gift Card, at Adorama you get a $50 Adorama Gift card and so forth..
A $50 gift card is what B&H Photo is offering with the GoPro HERO5 Black for $349 with free shipping. Meanwhile the baby GoPro, no relation to Baby Groot, the GoPro HERO5 Session Bundle is down to $249 with free shipping. B&H Photo has now defeated the Black Friday Ads by offering an even bigger gift card with the purchase of the new condition GoPRO HERO6 Black for $500. You get a $75 digital B&H Photo gift card! It is added automatically while this promotion is running, no coupon code needed! Another Black Friday Ads offer has been price-matched by the interwebs, it is the new condition GoPro Karma Drone with the GoPRO HERO6 Black going for $999 with free shipping at Adorama and Amazon itself (limit five) and at B&H Photo. The latest model GoPro HERO6 Black is on a drip-drop sale again, going for $478~ with free shipping, in new condition at Amazon by Amazon itself with up to three units per customer at the sale price. Its regular price is $500. The new condition GoPro HERO6 Black action camera is currently down to $478 with free shipping at Amazon by Amazon itself with up to three units per customer during the sale. The bundle with the 32GB Samsung microSD card is also appropriately discounted. More eBay Deals action now! This time it is the official GoPRO eBay store that is offering the manufacturer refurbished GoPro HERO4 Black Camera along with a $20 eBay gift card, together for $220 with free shipping. It comes with a 1-year manufacturer warranty! Limit up to two units per buyer. Over 6800 units have been sold from this eBay listing per the statistics over there. It does not say whether this is a plastic eBay gift card to be delivered in the box with the GoPRO, or an e-gift card by email. The GoPRO HERO6 goes for $500 with free shipping at B&H Photo and Adorama and Amazon by Amazon itself. But that’s not all. GoPRO is also bundling the HERO6 with the GoPRO KARMA, together going for $1200 at Amazon by Amazon itself (in-stock already) and B&H Photo (coming soon). If you are looking for official GoPRO accessories (instead of the hundreds of 3rd party ones), B&H Photo is offering the new condition GoPro Remote 1.0 and Wrist Housing Bundle for $29 with free shipping. This includes a Remote and various Mounting Straps. Also on sale is the GoPro 3-Way for the very specific price of $55.20 with free shipping. Sale time! The new condition GoPro HERO5 Session is on sale for $239 with free shipping at Amazon by Amazon actual with a limit of up to three units per customer during this sale. This is not a lightning deal. This is not “action camera day”, it just happens there are sales everywhere of them 🙂 BuyDig through the Rakuten website is offering the new condition GoPro HERO4 CHDHX-401 for $276 with free shipping until 7/16/17 or earlier if sold out. The price is automatically discounted while this promotion is running. You can use promo code REWARDME to get 5% in Rakuten Reward points. This does not change the price you pay. It only earns you Rakuten Rewards which you can use in future purchases. More Gold Box action, good until 11:24PM ET tonight (or earlier if sold out) is the new condition GoPro HERO+ LCD [Ecommerce Packaging] going for the very specific price of $124.09 with free shipping. The price before the sale was $154 last night. This is sold by a 3rd-party seller, with the order fulfilled by Amazon, so it is Prime eligible. It is 16% claimed as of 6:26pm ET.